We know that accidents happen in the home, so please refer to our quick reference guide below on how to treat various spills and stains from a DIY point of view. These should help you on your way to improving the appearance of these minor blemishes. Should you need further help, we will be more than happy to take your calls and attend your property to use our professional means of stain treatments. HKS carpet cleaning fact - Microbiological research from a survey of London streets has demonstrated that the carpets inside the homes were five to six times dirtier than the streets outside. After speaking to many of our customers, it has become clear to us that many people use inappropriate carpet stain removers or inappropriate means of removing stains. For this reason, we have had our own branded stain removers produced that are safe and easy for our customers to use, yet highly effective on many water based spots and spills on any washable fibre. Add to this, we will provide a 'bottomless' bottle of stain remover for as long as you are our customer. For a price of only £7, this is excellent value! 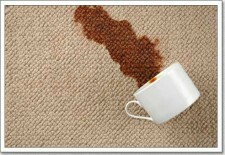 Never rub a stain, whatever it may be as you will run the risk of permanently distorting the pile of your carpet. You also risk spreading the stain by doing this. Always apply downwards pressure by dabbing at stains with white kitchen towel or a hand towel. Scrape up or blot up any excess prior to treatment. Do not use inappropriate detergents on carpets or upholstery i.e. (washing up liquid, wash powders, household bleach, disinfectants). Always work from the out side of the stain inward to avoid spreading. Apply small quantity of Surgical spirit to some cotton wool or cotton bud. Gently press (Blot) either Terry towel, or kitchen roll, and repeat as necessary until the stain no longer transfers. Do not allow penetration into the back of carpeting or foam filling materials! Some fabrics may darken initially during this process. Dry, using hair dryer, continually moving over the damp area. (This will help to prevent water marking). Dry with hair dryer keeping the dryer moving all the time, (this will help to prevent watermarking).